International Plant Nutrition Institute (IPNI) – South Asia Program, in collaboration with Indian Society of Soil Science (ISSS – Kolkata Chapter), International Maize and Wheat Improvement Center (CIMMYT), and Fertilizer Association of India (FAI – Eastern Region) has organized a one day training workshop on “Nutrient Expert: A Fertilizer Decision Support Tool for Maize and Wheat” on April 20th, 2013, at the Hotel Fortune Select Loudon, Kolkata, West Bengal. 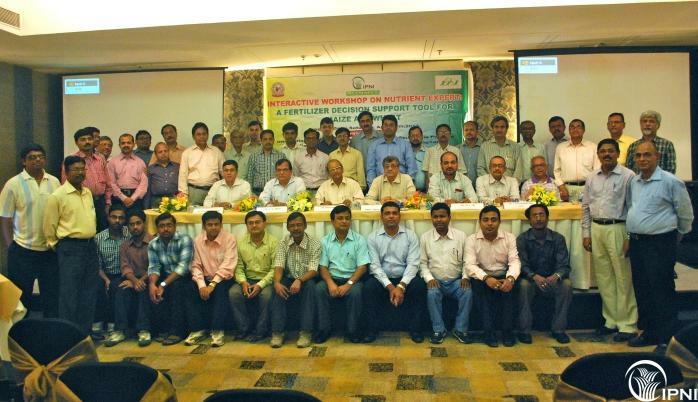 IPNI – South Asia Program is presently demonstrating the efficiency of the “Nutrient Expert” – a fertilizer decision support tool for maize and wheat in farmers’ field of West Bengal and other eastern states such as Bihar, Jharkhand and Orissa since last few years. Presently we have set up the "Nutrient Expert" trials in the farmers’ field in more than 30 locations of West Bengal. The results from demonstrating plots represent that the farmers using this tool for fertilizer recommendations receive higher yield vis-a-vis economic benefit by increasing production levels and by reducing the production cost for the maize and wheat. The unique feature of this tool is that farmers can get nutrient recommendations even if the soil testing results are unavailable. With the aim of reaching higher number of farmers to achieve the goal of food security in West Bengal, IPNI have organized this extensive training program and invited the state government employees, university scientists, along with industry professionals who can use this tool quickly for better nutrient recommendation to the farmers. In the inaugural session of the program, Prof. Saroj Sanyal, former Vice Chancellor of Bidhan Chandra Krishi Viswavidyalaya explained the application of nutrient decision support tool like Nutrient Expert during his “chief guest lecture”. Dr. Dipak Sarkar, Director, National Bureau of Soil Survey and Land Use Planning, Nagpur, ICAR, described the importance of balanced nutrient management. Dr. S. K. Singh, President of the Indian Society of Soil Science Kolkata Chapter described the association between IPNI and ISSS Kolkata Chapter. During the technical session Dr. Kaushik Majumdar, Director, IPNI South Asia Program described the relevance of Site Specific Nutrient Management (SSNM) tool in smallholder system. Dr. M. L. Jat, Senior Cropping System Agronomist, CIMMYT described the nutrient management implications in emerging Conservation Agriculture System. Dr. Sudarshan K. Dutta, Deputy Director, IPNI – South Asia Program (Eastern India and Bangladesh) showed the data related to the performance of Nutrient Expert for Hybrid Maize and Wheat. Dr. T. Satyanarayana, Deputy Director, IPNI – South Asia Program (Southern India and Sri Lanka) gave an overview of Nutrient Expert tool followed by a hands on training. There was a plenary session where the different experienced industry professionals from IFFCO, IPL and DSCL asked different questions to clarify their doubts. The interaction was quite lively with the inputs from state government officials as well as university scientists. All participants received a copy of the software and a user manual. At the end of the day participants left the workshop with a vow that they are going to use this software on their own whenever appropriate.